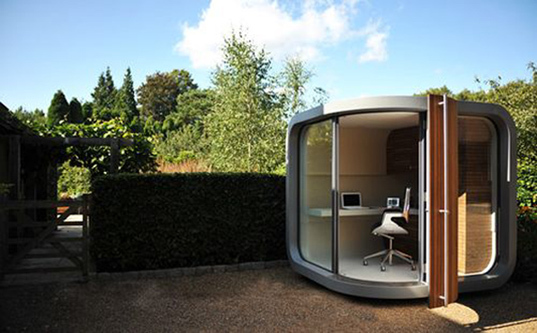 OfficePOD - A high-tech garden shed? 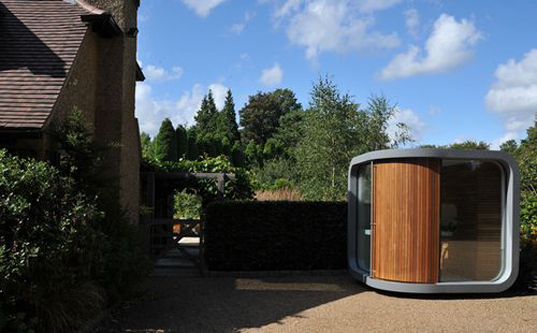 OfficePOD is a modern prefab that aims to bring the office experience to your backyard in an eco-friendly ‘pod-like cube’. As people begin to work from home more frequently by harnessing cloud networking and wireless technology, OfficePOD allows the masses to have an environment close to home where they can still maintain a work mentality, but with the benefit of their own kitchens being nearby. Bringing a whole new meaning to the phrase ‘work/life balance’, OfficePOD was born out of the desire to create a work area at home without spending a lot of time and money. As such, OfficePOD enables people to work away from distractions in a fully installed office – complete with desk, storage, lighting and window blinds… just in case your work is top secret. In addition to minimizing your carbon footprint by no longer commuting to work, the OfficePOD also enhances your green credentials by having the highest rating under the Energy Performance Certificate scheme as well as under the BREEAM rating program. In fact, according to an independent study, by opting for an OfficePOD you can cut your own CO2 emissions by between 46 and 67 percent. Interested? Based in the UK? Rich? Well then, for a mere £14,950 ($24,400) plus installation and VAT, you too can have your own office away from the office. Nice modern office for the garden. I wonder if it comes in different sizes? OfficePOD is a modern prefab that aims to bring the office experience to your backyard in an eco-friendly 'pod-like cube'. As people begin to work from home more frequently by harnessing cloud networking and wireless technology, OfficePOD allows the masses to have an environment close to home where they can still maintain a work mentality, but with the benefit of their own kitchens being nearby.